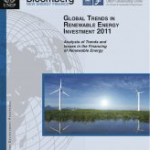 Global investment in renewable energy jumped 32% in 2010, to a record $211 billion. In addition to this eye-catching record, the investment activity in developing countries increased strongly. It is the first time the developing world has overtaken the richer countries in terms of financial new investment. their remarkable growth in 2010.
like feed-in tariffs and target-setting sparked a record $211 billion of investment in renewable energy. rooftop solar projects surged to $60 billion-worth of investment, up over 90% from 2009. 3.3% to over 7.5% by 2012.
nearly seven-fold to $740 million. 2010 also saw important investment in Chile, Peru and Venezuela. developing regions, if the emerging economies of Brazil, China and India are excluded. and biofuels. Small but significant advances were also made in Cape Verde, Morocco and Zambia. insecurity, stimulating green jobs and meeting the Millennium Development Goals. efficient Green Economy in the context of sustainable development and poverty eradication. 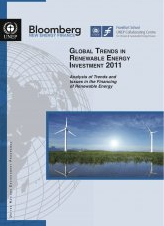 The Global Trends Report 2011 offers an elaborate analysis of Trends and Issues in the financing of renewable energy. Please don’t forget to download the corresponding GTR Chartpack from our website as well. Log in | 77 queries. 0.780 seconds.